I’ve been rereading 1984 with two of my teenage daughters this summer, and due to the laws of synchronicity, I now see Orwell references everywhere. Recently, I’ve come across two articles on a now famous excerpt from his 1946 essay, “Politics and the English Language.” It’s a provocative essay, and I thought I’d share my own take. In the novel, 1984, a key tool in the hands of Big Brother and the Party is the manipulation of language. The book’s appendix is a fascinating read for anyone concerned about the relationship between language and political power. Orwell elaborates on these themes in the essay. “Politics and the English Language” is worth reading, even if some of his concerns are dated (bad writing today is just as bad as it was then, but in different ways). He gives examples of pompous, convoluted writing and, in the section that is most often quoted today, offers five rules to avoid mumbo-jumbo and sloppy writing. Here are the rules and some brief commentary. Generally an excellent rule worth following. Of course, there are times when cliches are useful, but generally speaking, they should be avoided. They are the crutch of lazy writers. Figures of speech are intended to give the reader new and creative ways of looking at things. It matters, of course, what is meant by “will do.” Sometimes a longer word provides color, cadence, or connotation that makes it preferable to the shorter one. There are times when a character should prevaricate rather than simply lie. Perhaps a better way of expressing this rule would be: A long word isn’t better simply because it is long. Hm. Not so sure of this one. I am a fan of brevity and conciseness, yes, but there are many other considerations. In fact, wouldn’t it be possible to cut out always from that sentence? I think my problem here is with the word possible. Just because a word can be eliminated does not mean it ought to be eliminated. Rhythm, style, and tone should be taken into consideration as well as literal meaning. The basic principle, however, is the same as in the previous rule: more is not always better. This rule has achieved a degree of sanctity among writing instructors today. But it’s important to remember that the passive voice exists for a reason, and there are legitimate uses for it. The point is to limit the use of passive voice to where it is most effective, and those occasions are admittedly few. Active verbs tend to improve the clarity and energy of one’s writing. There are a handful of exceptions here. Abbreviations from Latin like etc., i.e., and e.g., for example, are common enough, as are familiar terms like pro bono, and laissez faire. Otherwise this is good advice, though a bit dated — using foreign terms to impress readers seems to be less of a problem today than it may have been in the ’40s. I’m glad Orwell qualified his rules, although I think there are reasons to break them that fall short of barbarous prose. Orwell’s rules for writing overstate and oversimplify, but as general principles, they hold up pretty well after more than half a century. Writers of all ages would be well-advised to commit them to memory and practice. 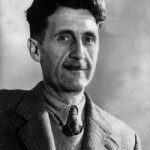 Your need to disagree today with what Orwell wrote yesterday reveals one of the great things about Orwell’s writing: he consistently wrote to his own time and particular context rather than for posterity or lasting notariety. Think about what he wrote about in “Such, such were the days”. English bording schools of the type that he and his contemporaries (like CS Lewis) attended. I can’t “relate” to the strange world of abuses and problems of that system. However, they give a window and hermeneutic aid to understand Orwell and the the past. I’d say Kierkegaard is another great example of this “situatedness”. Most of what he wrote was so context-oriented that without learning some about the context it’s easy to misunderstand or get bored. But he had those few works that just sing as universal inictments of false christianity (“The Crowd Is Untruth”) and inquiries into the nature of faith (“Fear and Trembling”). I think this “situatedness” increases a writer’s appeal especially if their situation has things to teach our situation. It is also more authentic and can be relatable given that though we live at the edge of the future (i.e., the present) soon what we go through will be the past and seen as a particular place and time with its own context. Excellent and well-stated thoughts, Mike. Thanks. 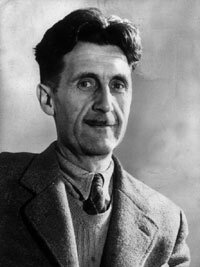 Orwell’s five rules (which I’ve used many times in writing classes) along with your clear and balanced commentary combine to make a purely perfect writing lesson! Did I use a cliche in my note on not using cliches? Is referring to cliches as “the crutch of lazy writers” a cliche? Any suggestions for how to improve that?